People take part in a candle lit vigil in the western suburbs of Melbourne on January 4, 2010 where Indian student Nitin Garg was fatally stabbed on January 2, 2010. (CNN) -- A weekend killing in Australia has prompted the Indian government to issue an advisory for its college students studying in that country. "While the majority of Indian students studying in Australia, especially those enrolled in universities and reputable institutions, have a positive experience of living and studying in Australia, the number of such incidents of assault as well as of robbery has been on the rise in recent months, which has affected not only Indian students but also members of the larger Indian community in Australia," said a statement from India's Ministry of External Affairs. Nitin Garg, 21, was stabbed to death Saturday night in Melbourne as he walked to work from a train station through a public park. Deputy Prime Minister Julia Gillard dismissed the notion that Australia is a unsafe for international students. "Australia is a very safe country. By world standards, we have a very low homicide rate," Gillard said Wednesday. "In big cities around the world, we do see acts of violence from time to time; that happens in Melbourne, it happens in Mumbai, it happens in New York, it happens in London." • Don't carry too much cash. Do not make it obvious that you're carrying expensive items, such as iPods or laptops. 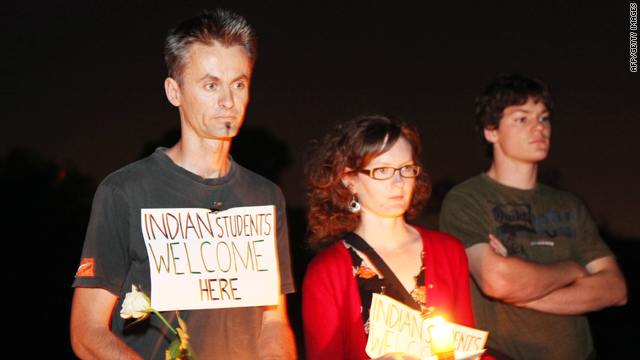 Australia has seemed increasingly less safe for Indian students over the past year. During a one-month period over the summer, at least 10 Indian students were attacked. The most severe case left an Indian student in a coma; another student was stabbed in the stomach. More than a dozen arrests were made. Australian authorities said at the time that they didn't think the attacks and robberies were racially motivated but were instead crimes of opportunity against soft targets: students who typically travel alone at night on public transportation. But hundreds of Indian students saw it differently. During the summer, they reacted with protests in at least three Australian cities. Police said at one point that Indian students had decided to take the law in their own hands and retaliate, which was condemned in India and Australia. Australia has a lot riding on its reputation as a destination for international students. It has an estimated $12.6 billion-a-year education export industry. More than 90,000 students from India study in Australia. CNN's Ed Payne and Harmeet Shah Singh contributed to this report.